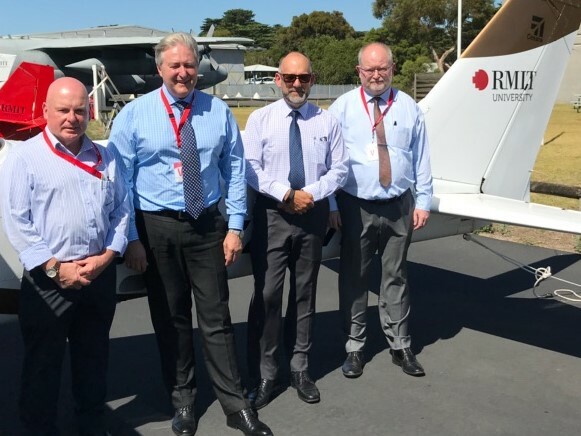 IBSA Manufacturing recently met with Mike Heffey, Chris Hudson and Ian Bailey (pictured with IBSA’s Vince Panozzo) from RMIT University College of Science, Engineering and Health at RMIT’s Point Cook aviation training facility to discuss progress in the ongoing development of the MEA Aeroskills Training Package. The Aeroskills Case for Endorsement, draft Training Package components and Companion Volume Implementation Guide have been submitted to the Australian Industry and Skills Committee (AISC) for consideration. The Case for Endorsement includes a description of how the training package components were developed, an overview of the changes made, consultation processes and evidence of alignment to the standards for development of Training Packages. Thanks to all members of the Aerospace Industry Reference Committee (IRC) and industry networks, who have given their time to shape the changes to Certificate IV in Aeronautical Life Support Equipment, the skill set Aircraft Egress System Maintenance and 46 additional units to ensure they meet the regulatory requirements. The training package components remain draft until approved by the AISC and available on the national register (www.training.gov.au).